Currently, Mr. Gordon Otieno Odundo is the Chief Executive Officer of the Nairobi Hospital, Kenya which was established in 1954. The Hospital has excelled in medical expertise and services provision, and has deservedly earned recognition throughout East Africa and beyond as an advanced diagnostic, treatment and referral centre. Expansive investment in latest technology and medical equipment has enabled the Hospital to establish leadership in medical procedures both in Kenya and outside. 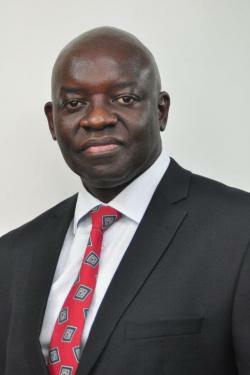 Prior to joining the Health Sector, Mr. Odundo was a Senior Executive in the Hospitality Industry, then joined the Health Sector, largely at the Gertrudes Garden Children’s Hospital where he served for 13 years as the Chief Executive Officer. During his tenure, Mr. Odundo implemented successful access to Child Health Services both in Nairobi and Mombasa. Gordon is a holder of MBA from United States International University-Africa (USIU-A) and also has qualifications from Leeds University in Hospital Management among other numerous academic qualifications.